HEAT OF DAMAGE are a young band…a very young band. But you know what? When you hear the songs on their full-length debut Open Fire you sure as Hell won’t think so! I knew nothing about these guys when I got the record but I was definitely impressed right away. They manage to put together modern rock and metal in such a way that it’s really hard to classify which one of those they belong to. And the fact they can’t be pigeonholed makes them all the better in my eyes. “Judgment Day” is full on metal, though. Especially with the duelling guitar lines, licks, and leads. Vocalist/guitarist David Haug and lead guitarist Nick Lassalette play off of one another very well and you’re immediately transported back to the days of yore. Drummer Julian Bohland cements that notion with his double kick drum action and bassist Jared Easter is right there every step of the way, holding it all together. And then, all of a sudden, it’s 2003 and I’m hearing a tune THE ATARIS (LOOOOOVE that band!!) could have written in “Accessory”. These two were instant favorites for obvious reasons! “Fade Away” is a slow number that moves well and is never plodding, and “Veil of Authority” is the type of track modern radio and/or Sirius Octane should be drooling over. With just the right amount of groove, anger, and melody you can put a big bow on this one and deliver it for Christmas to every program director in the country. The song “Heaven” is guaranteed to get asses out of seats and have a place hoppin’. The guest vocals of Katie Robinette from A MILE TILL DAWN only makes it better. This is at times a very heavy record and “The Greeding Party” only cements that point further. All four members are locked in and ready to knock down walls and punch you in the goddamn head. But the disc also has a tune with hearty groove and a lot of cowbell plus a dirty guitar line on “Little Miss Hill”. Closer “Any Other Way” was another favorite. I love the way the vocals and guitars ring out and give it their all. It’s one that will have many of you bobbing your heads for sure. 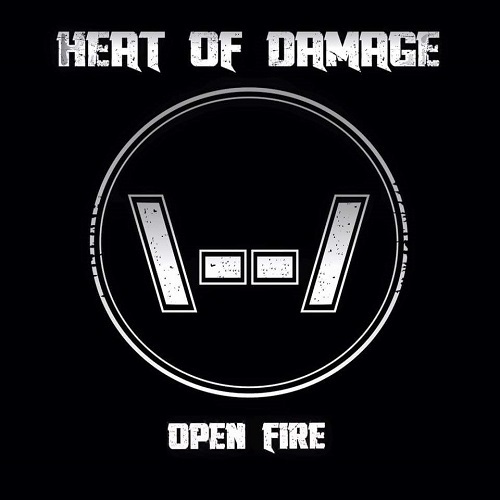 At the end of the day HEAT OF DAMAGE are very much a real kickass band. Do they need some polishing? Absolutely. But I think they’re goin’ places. Check out Open Fire now; don’t be the one who missed it.